Calluna vulgaris is the sole species in the genus Calluna in the family Ericaceae. 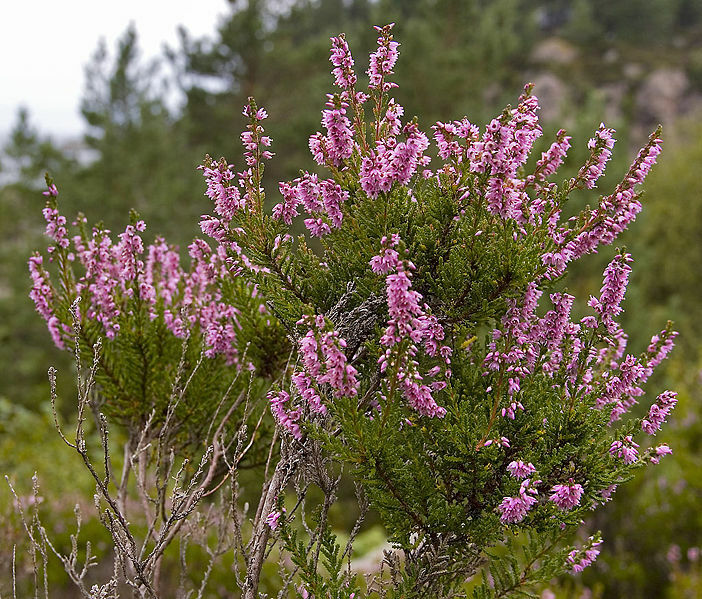 It is the true Heather of Europe, and National Flower of Norway. However it also has an affiliation to Scotland. It is a small perennial shrub growing to 20-50 cm tall (rarely to 1 m), and is found widely in Europe and Asia Minor on well-drained acidic soils in open sunny situations and in moderate shade. It is tolerant of moderate grazing and can regenerate following occasional burning. It is often managed in nature reserves using a light burning method. It is a common, often dominating, component of heath and moorland habitats, and also on peat bogs and in open pine forests. It is separated from the closely related genus Erica by its four-parted corolla and calyx. The flowers emerge in late summer, and in the wild species these are usually in purple or mauve shades. Heather is an important food source for various sheep and deer which can graze the tips of the plants when snow covers low growing vegetation. Red Grouse feed on young shoots and seeds. Both adult and larva of the Heather Beetle Lochmaea suturalis feed on it, and can cause extensive mortality in some instances. The larvae of a number of Lepidoptera species also feed on the plant - see list of Lepidoptera which feed on Heather. The personal name "Heather" was inspired by the plant.